EB Forum • View topic - Currency Wars, USD, YEN, Bitcoin and what it means to you. Currency Wars, USD, YEN, Bitcoin and what it means to you. You love calling me names! Did you travel to NZ with your mom and dad??!! Shorting right about here 1283 /GC. Shorted ETH here at 152usd, looks scary right now. But unexpected drop overnight. I will feel good if ETH can hold around the $150 range after Constantinople. If not, accumulation continuing I guess. Do you guys believe in a strong come back for either ETH or OMG? I invested in both and admittedly have stopped following but I'm not sure that these investments will ever amount to anything other than a loss. questkid32 wrote: Do you guys believe in a strong come back for either ETH or OMG? I invested in both and admittedly have stopped following but I'm not sure that these investments will ever amount to anything other than a loss. Haven't kept up with OMG lately as I sold all of mine last year. I'm not worried about any solid project in the crypto world... then again I am a long-term kinda guy and not looking for quick short term gains. Figure out which one you are and then make your decisions based on that. Just because it's a bear market doesn't mean you can't make money. 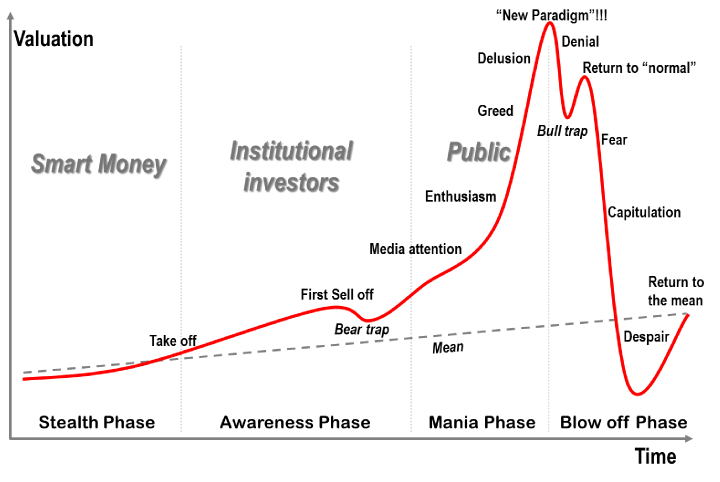 I have spent most of the last year making sure all of my bags will be filled for when the next bull run kicks off, whenever it will be. Gun to my head, I would say the market starts to turn at some point in mid-late 2019. The next BTC halving I believe is May of 2020 and I just read the other day that the avg growth in the 12 months before each halving event has been over 200% (I think closer to 250% but I can't remember). This would coincide with major firms rolling out BTC products to their clients so when demand shrinks and supply increases, well we know what happens there. Looking forward to the years ahead. My hatred of how bad the show got over the last few years made me forget about how good the comics are. I think I'm about 2 years behind on them... might have to brush up soon. Gold, Stocks, and Bonds all up at the same time???? Positive indication for upward continuation for next three months historically. My attempted GC short got stopped out awhile ago at a loss. Gold mining stocks...double digit growth this year is quite feasible, even buying today. The gold price has increased nearly $80 since I broached it here over Xmas. But whose gonna listen to me??!! i got a couple gold miners IAG and NGD, small share positions. Had some AG but sold on last run up. Hearing a couple things about possible buy out of IAG. Comon Barrick buy it.